During a recent trip to Abu Dhabi, Teamspeed forum member Captain Stradale caught a glimpse of the BMW Vision EfficientDynamics strutting its stuff for an on-track photo shoot. What makes us most curious, though, is the fact that this gray version of the VED is marginally different-looking than the white concept BMW has paraded around the auto show circuit over the past year (along with the white with blue swirly camo prototype they've shown). The Vision EfficientDynamics, which is rumored to come into production under the name 'i8', is expected to be powered by a 328-horsepower three-cylinder diesel-hybrid powertrain. The ultra-lightweight production car is tipped to run from 0-100 in just 4.8 seconds, and during normal driving, the new efficient supercar is estimated to achieve 62.5 miles per gallon. When we'll see the production version of the VED is still unclear, though sources have reported that it will show up in 2013, priced from around $200,000. We can't verify if the gray car in these Teamspeed shots is anything closer to production, but seeing this thing out on the track makes us all the more eager to experience BMW's efficient hotness for ourselves. In the meantime, check out the spy video after the jump and click on the link below to see more photos at Teamspeed. Thanks to everyone for the tips! 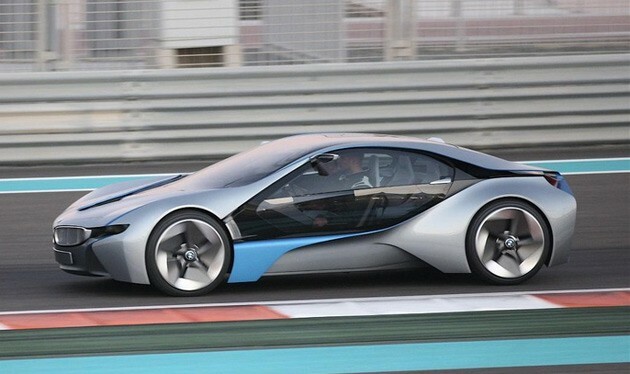 BMW Vision EfficientDynamics spotted in Abu Dhabi - is it closer to production? [w/video] originally appeared on Autoblog on Fri, 31 Dec 2010 17:57:00 EST. Please see our terms for use of feeds. Nice, but this will merely fall to over priced dream range for most people.